After six years of intensive efforts, on 16 August 2017, Peru and Chile opened their first joint integrated border control centres. This new system aims to facilitate the movement of people, baggage and motor vehicles, and is an example of the practical implementation of the coordinated border management concept promoted by the WCO and other international organizations such as the World Bank and the Inter-American Development Bank. On 19 January 2011, a “Framework Agreement for the Implementation of Integrated Control and Cooperation Systems for the Facilitation of Movement at Operational Border Crossings between the Republic of Chile and the Republic of Peru” was signed. 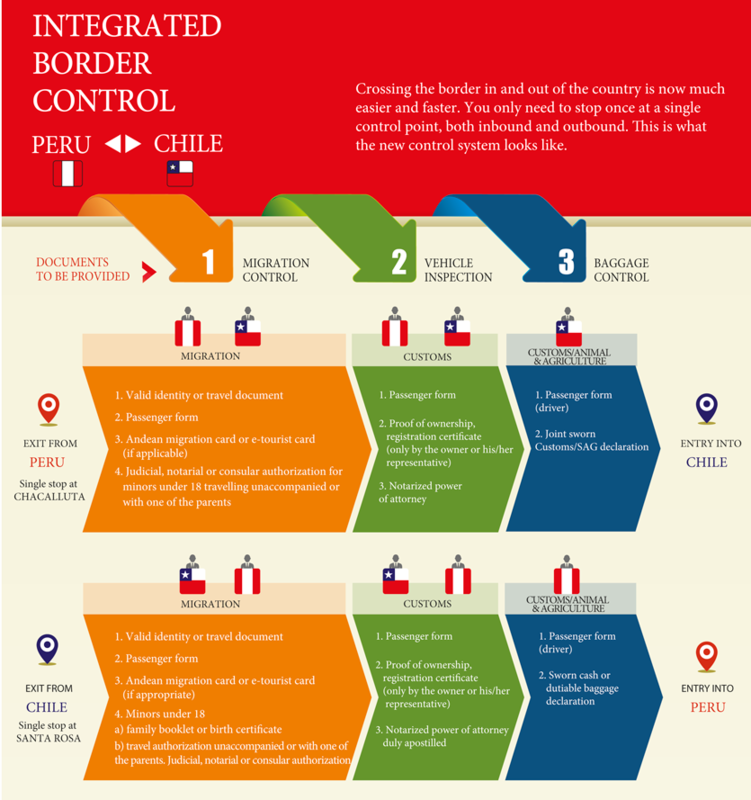 The Agreement sets the standards for the operation of these Integrated Border Control Centres (IBCC) at the border posts of Santa Rosa in Peru and Chacalluta in Chile, and includes legal provisions covering issues such as jurisdiction and competence, or the operational aspects that are necessary for the good functioning of the Centres, not covered by other agreements or conventions in force between the two countries. In the six years that have elapsed since the framework agreement was signed, several bilateral coordination meetings have been held in order to examine legal and technical issues as well as questions related to infrastructure and logistics, with the aim of widening the scope of the competences of each authority in the other country, and in order to carry out pilots and practical exercises, allowing both parties to finalize the operational details and guarantee effective coordination between all governmental agencies at the border, once the Centres become fully functional. The set-up of a Bilateral Coordination Committee (BCC) played a key role in this respect. Mandated to be the supreme decision-making body and chaired by the authorities present at the border posts of Santa Rosa and Chacalluta, with the support of their respective foreign affairs ministries, the BCC met once a month alternately in Peru and in Chile. The agreements reached during the course of these meetings have legal status according to international law. This methodology aimed to create a cooperation and coordination mechanism between Customs and the migration agencies from both countries, ensuring that progress was made in the shortest time possible. Integrated border control is a type of control involving the migration services (Peru’s Superintendencia Nacional de Migraciones and Chile’s Policía de Investigaciones or PDI), the Customs administrations (Peru’s Superintendencia Nacional de Aduanas y de Administración Tributaria or SUNAT and Chile’s Servicio Nacional de Aduanas), and the animal and agricultural health agencies (Peru’s SENASA and Chile’s SAG) of both countries in the framework of a juxtaposed border post. These different bodies carry out joint controls, in pairs, some of which involve both countries, on a one-stop border post basis. Users need only stop once, at the centre in the territory they are entering. In other words, each country carries out controls upon entry into its territory following a joint control model between the competent authorities of both countries. At present, inspections only focus on private motor vehicles as well as vehicles used for the transport of passengers (cars and public service buses for cross-border transport by road). In 2017, some six million people and more than a million cars crossed the border. In the future, the integrated border control system between Peru and Chile will also process cargo – a feasibility study is being carried out by both countries to this effect. The implementation of an integrated border control system between Peru and Chile has reduced the crossing time for tourists and visitors at the border by more than 50%, as they only need to stop once. The project has also facilitated the movement of vehicles and people in the region, contributing to trade facilitation, especially in the cities of Tacna in Peru and Arica in Chile, and, more generally, to an increase in tourism between the two countries. Some issues are still pending, among which are the implement at ion of a paperless environment and the dematerialization of required documents. The ability to submit an electronic passenger list will need to be further explored. Technologies will have to be deployed for automated number plate recognition, for example, or for a risk-based selection of motor vehicles for inspection, according to the WCO SAFE Framework of Standards, in order to facilitate flows at the border and promote a secure, expedited and transparent commercial/business environment. Other centres could be set up in the future. Peru Customs’ approach is to use integrated border control as a tool to streamline the flow of goods and people at all its border posts, and in this regard, contact has been taken up with Bolivia, Ecuador and Brazil in order to discuss the implementation of this new mode of operation with them as well. The successful implementation of the first IBCCs at the borders between Chile and Peru is first and foremost the result of a political agreement between the Presidents of both countries, whose enlightened decision has benefited travellers and passenger transportation companies alike, but which will also benefit cross-border traders in the future. It is also the result of an unprecedented collaboration effort between the Peruvian and Chilean Customs authorities. More generally, it is a concrete example of the commitment taken by Latin American Customs administrations in favour of two of the WCO’s top priority areas, namely the integration of borders and trade facilitation.